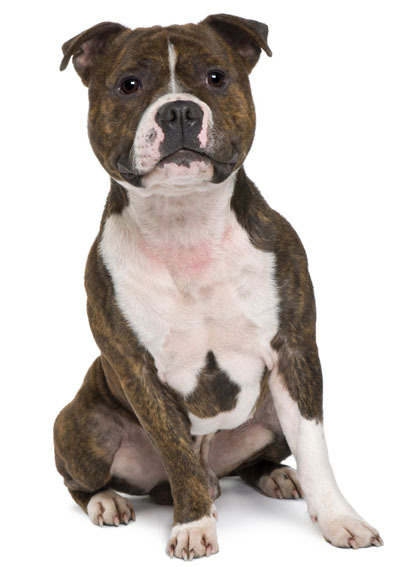 Learn about the temperament and personality of the Staffordshire Bull Terrier. Discover what he's like to live with, his traits and characteristics and how he generally behaves. And look at lots of Staffordshire Bull Terrier photos. The Staffordshire Bull Terrier is a true people-dog. He loves people, all people, especially children. His tolerance of and patience with children has earned him the nickname "The Nanny Dog." The Staffordshire Bull Terrier, sometimes called "Staffy" for short, is a strong, athletic, agile, and active dog who craves your affection and attention, and if he doesn't get it, he can suffer from separation anxiety. He absolutely hates being left alone and can become destructive if it happens. He will want to go for rides in your car, cuddle in your lap, and sleep in your bed. This is an energetic breed who needs daily exercise. They love to play ball and go for walks. The Staffordshire Bull Terrier can overheat easily, so exercise in hot weather needs to be closely monitored. Staffords are intelligent and take fairly well to obedience training, as they are eager to please you. They make good watchdogs, as they usually only bark for a reason. They will passionately defend their family from harm, but are not particularly protective of property. His intimidating look will deter almost any intruder, so this makes him an excellent guard dog! They do have a high prey drive and will often chase cats and other small animals. They do best with a fenced-in yard, as they can be a bit impulsive and they are not car smart. Staffordshire Bull Terriers have a well-earned reputation for being dog aggressive so it is important to socialize a puppy around other dogs and animals as much as possible. The Staffordshire Bull Terrier is a courageous, affectionate, trusting and trustworthy all-purpose dog. They are adaptable and can live anywhere. They are boisterous and exuberant and might irritate your houseguests. They are curious and have a good sense of humor. They are surprisingly sensitive and they will crave your attention and companionship. They want nothing more than to be your faithful best friend. The Staffordshire Bull Terrier is moderately easy to train. He learns new commands at the average rate. He is neither difficult nor easy to train. The Staffordshire Bull Terrier sheds a fair amount of hair. You'll find hair stuck to your couch, carpets, clothes and everything else in your home.